A little town in Galicia, in Eastern Europe. Located between modern-day Poland and Ukraine. Lesley Rausch as Swanhilda in George Balanchine’s “Coppélia.” Photo by Angela Sterling. Frantz’ fiancée is a sprightly village lady who loves to dance with her friends and cause some mischief. 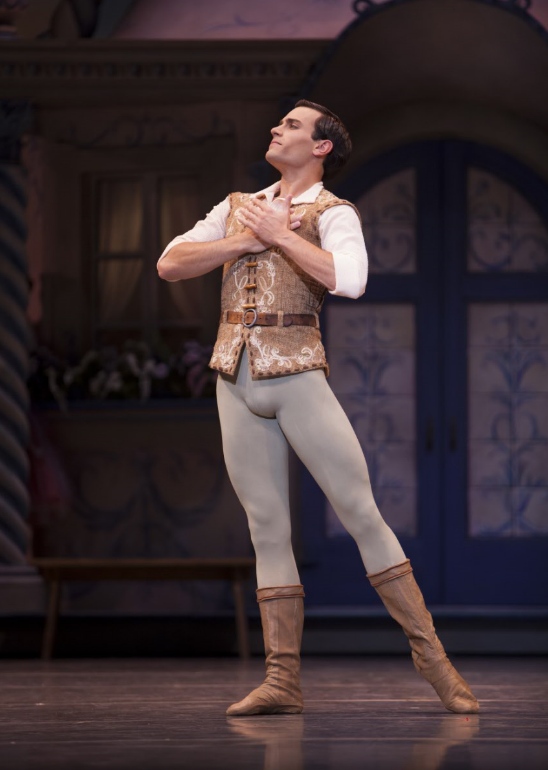 Jerome Tisserand as Franz in George Balanchine’s “Coppélia.” Photo by Angela Sterling. Swanilda’s finacé who thinks the Coppélia doll is a real woman. 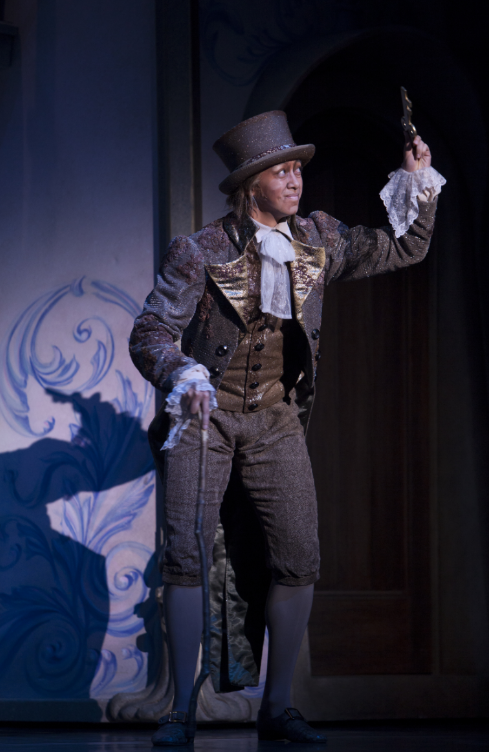 William Lin-Yee as Dr. Coppelius in George Balanchine’s “Coppélia.” Photo by Angela Sterling. The mysterious man who makes mechanical dolls. Elizabeth Murphy as the Coppelia Doll in George Balanchine’s “Coppélia.” Photo by Angela Sterling. Dr. Coppelius’ most perfect creation. 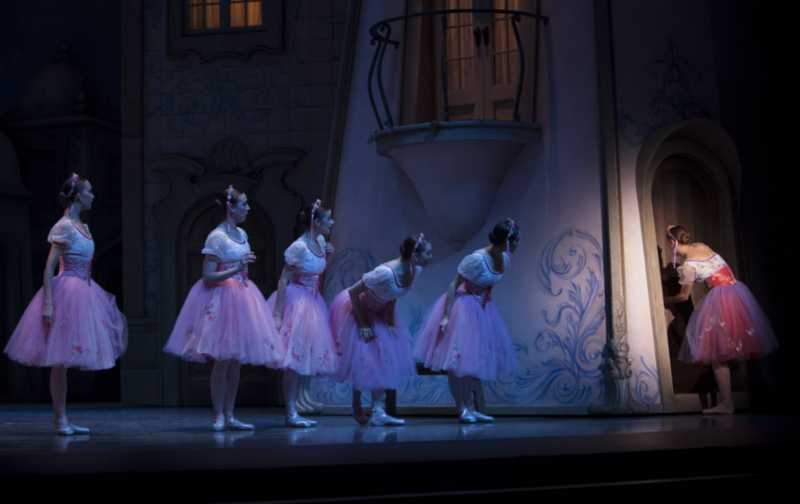 Swanilda & her friends in George Balanchine’s “Coppélia.” Photo by Angela Sterling. Eight lovely ladies who love dancing with Swanilda’ and decide to sneak into Dr. Coppelius’ workshop. 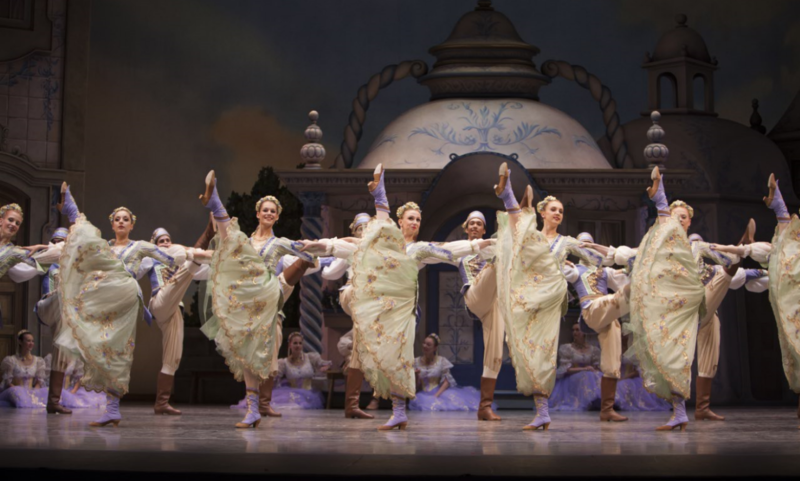 Villagers in George Balanchine’s “Coppélia.” Photo by Angela Sterling. A gleeful group who celebrate in the Village Square. The doll Coppélia, often is seated on a balcony of his workshop overlooking the village square. She is so lifelike that everyone believe her to be a real girl, including Franz. Swanilda is not pleased. Oh well, Franz thinks, she’ll get over it. The town’s mayor then arrives to announce the next day’s festivities in honor of the town’s new bells. He gives Swanilda and her friends blades of wheat. 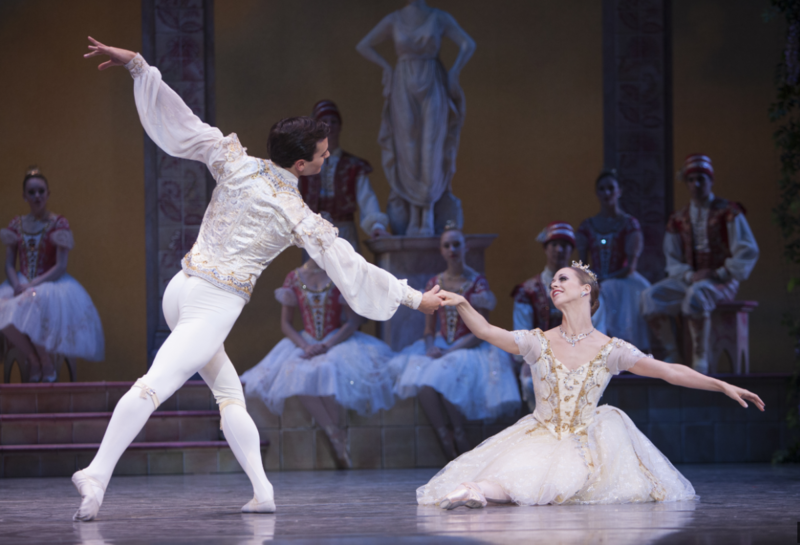 Lesley Rausch as Swanhilda & Jerome Tisserand as Franz in George Balanchine’s “Coppélia.” Photo by Angela Sterling. If the wheat whispers, their boyfriends must love them. Swanilda dances with Franz, but her blade of wheat is silent. 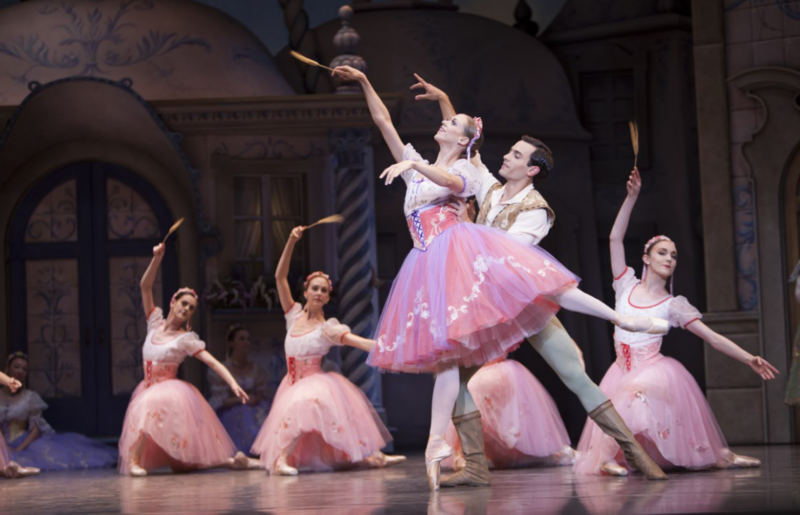 She rushes off in tears, suspecting more than ever that Coppélia is Franz’s true love. Her spirits are quickly restored, however, and she joins her friends in a dance. Other villagers dance a Hungarian czardas and the mayor departs, leaving Franz and Swanilda at a stalemate in their courtship. Sneaking into Dr. Coppelius’ Workshop in George Balanchine’s “Coppélia.” Photo by Angela Sterling. As night falls, Franz and his friend pull a prank on Dr. Coppelius as he walks home to this workshop. Meanwhile, Swanilda and her friends find the key to Coppelius’ house and decide to sneak in. Franz has the same idea. He climbs by ladder into Coppelius’ workshop. The girls skeptically explore the workshop. They find the doll Coppélia and Swanilda is relieved to discover that Coppélia is only a doll. While she and her friends are winding up the other dolls, Dr. Coppelius enters. 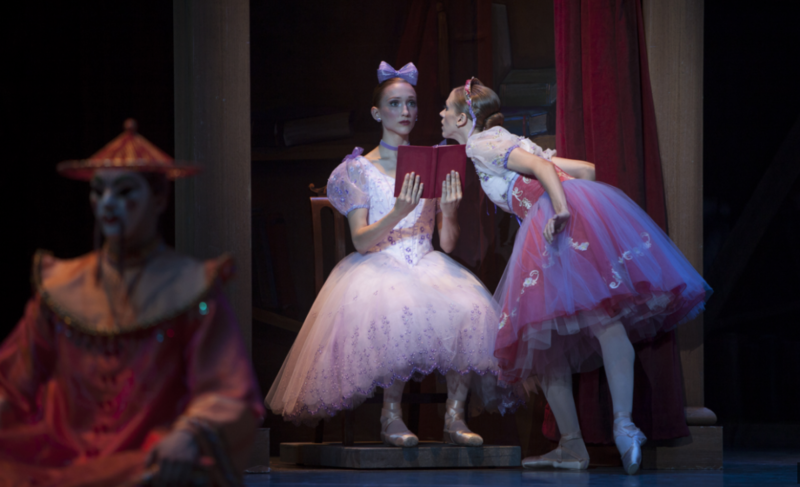 Everyone escapes except Swanilda, who hides behind the curtain with Coppélia. 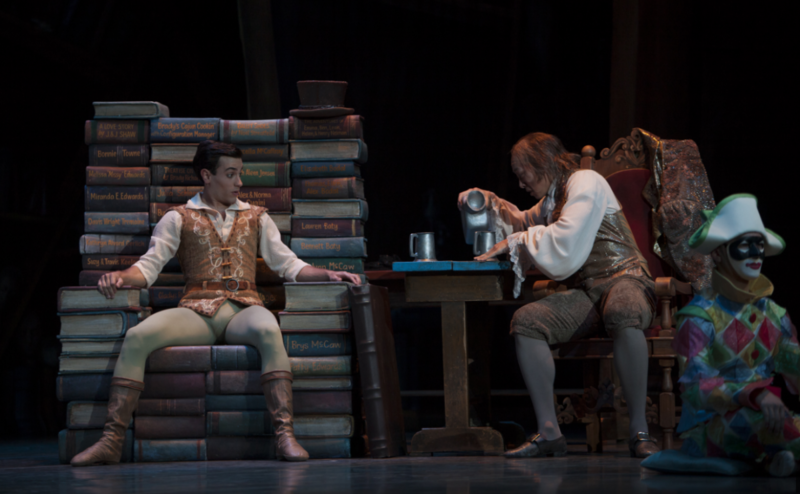 Jerome Tisserand as Franz & William Lin-Yee as Dr. Coppelius in George Balanchine’s “Coppélia.” Photo by Angela Sterling. Now Franz steals in. He explains to Coppelius that he loves his “daughter” Coppélia. The doctor realizes that Franz is the perfect vehicle for an experiment which can transform his cherished creation into a real girl, with a bit of help of wine and a magic formula. What Coppelius does not realize is that Swanilda has dressed herself in Coppélia’s clothes and is pretending to be the doll. Lesley Rausch as Swanhilda & William Lin-Yee as Dr. Coppelius in George Balanchine’s “Coppélia.” Photo by Angela Sterling. Dr. Coppelius goes through various stages of his experiment. 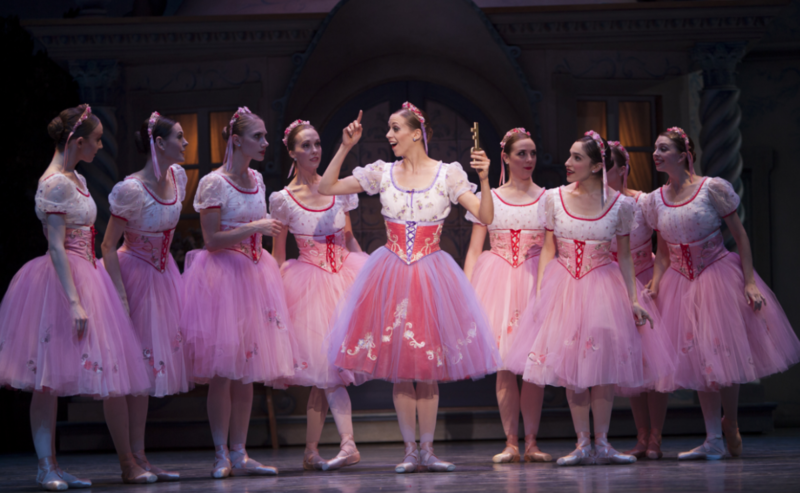 Coppelia “magically” comes completely to life as Swanhilda persists in more mischief. When Franz awakens, Swanilda reveals her identity, and brings out the real doll, who is now no more than a cluster of limbs. Franz, understanding how foolish he has been to love a mere doll, escapes with his real love, Swanilda. Dr. Coppelius sees that he has been fooled and is left in utter devestation. Today is the celebration for the town’s new bells and the wedding of Swanilda and Franz. The wedding couples seat themselves and watch beautiful dances, signifying occasions on which the bells will be rung—for work, prayer, war, peace, dawn, and other golden hours. After one of the dances, a storm approaches, signaling the threat of discord and war. Discord & War in George Balanchine’s “Coppélia.” Photo by Angela Sterling. The townspeople and children take shelter from the storm while warriors, male and female Valkyrs, dance. Peace and good weather return, and the villagers usher in Swanilda and Franz. Everyone joins for a final celebration.